traditional Goan Christmas celebrations. In the old days carollers would serenade through the neighbourhoods spreading the joy of the season as they go along. Keeping the custom of carol singing in public spaces alive, last year’s Carol Trotters that comprised of a group of friends returned with ‘Caroling for a Cause’. 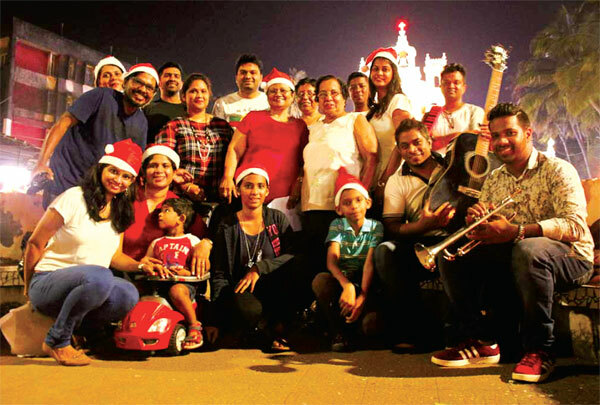 This year the group of 20 more carollers and musicians came in from Margao, Verna, Anjuna, Panjim and Divar. The session was held in front of the Immaculate Conception Church. Cecundita Picardo who brought her kids Eshaan and Aanya along from Divar says that it offered her a wonderful opportunity to be part of the beautiful atmosphere in Panjim. “It’s hard to find a city like Panjim anywhere else, “she adds. “Happy souls brining a smile this Christmas” is what Vinette D’Souza says who joined the group this edition. But the carollers weren’t the only ones beaming with Christmas spirit. The jam session brought musicians together as well. Coincidently the members from the brass band who had assembled at the space to play post the novena service joined the carollers. Nixon Fernandes was on trumpet; Alden Fernandes who was part of last year’s edition came in with his guitar. John Lino and Andrew Ferrao kept everyone in tempo with their melodicas. Musician Andrew Ferrao who rode in from Verna says, “After returning from Mumbai, this gave me an opportunity to reconnect with the old traditions of carol singing after nearly 20 years. I had a great time playing my melodica with other musicians.